Mothers-to-be with lower levels of the vitamin folate in their body during early pregnancy are more likely to have low weight babies, research suggests. A team at the University of Newcastle upon Tyne studied nearly 1,000 women and their newborn babies. Low birth weight is associated with an increased risk of serious health problems, including respiratory disorders and diabetes. The research is published in the British Journal of Nutrition. Women are already advised to take folic acid supplements if trying to conceive, and through the early weeks of pregnancy as the vitamin is known to reduce the risk of neural tube defects such as spina bifida. But this is the first time the vitamin has been linked to birth weight. The Newcastle team say their work adds weight to the argument that bread and cereals should be routinely fortified with folic acid. They found pregnant women who smoked were more likely to have lower levels of folate in their blood - which might explain why women who smoke often have lighter babies. 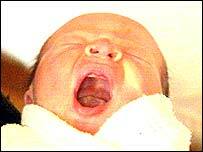 It is estimated that around 7% of all babies born in the UK are low birth weight - defined as less than 2.4kg (5.5lbs). 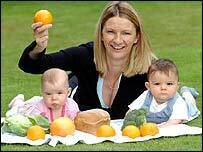 Ruth said: "I knew that folic acid was good for me and my babies in many ways." Medical evidence suggests that folic acid influences birth weight because it is an essential nutrient for growth and plays a role in gene expression in the foetus. The researchers say smoking is likely to reduce a women's folate levels because it may alter the ability of the cell to metabolise and ultimately store the vitamin. Lead researcher Dr Caroline Relton said: "Folic acid is highly important in preventing birth defects which affect a small number of pregnancies. "This study suggests that it is also important in every pregnancy to help the developing baby reach a healthy birth weight. "However, many women are missing this critical window in the first few weeks of gestation during which their baby really needs folic acid to grow and develop. "The evidence from this study strengthens the argument for fortifying everyday foods like bread and cereals with folic acid. "Fortifying a range of foods promises to be a more effective solution than a campaign to encourage women to take folic acid supplements. "Our previous research shows younger women and those from deprived backgrounds are less likely to take these supplements, and although some cereals are currently fortified in the UK, they tend to be the more expensive, brand-name products." Dr Robert Frazer, an expert in obstetrics at Royal Hallamshire Hospital, Sheffield, told the BBC News website more work was required to prove cause and effect. He said low levels of folate were also associated with a poor diet in general, which might have a negative effect on a baby's growth. But he said: "There is already a strong case for fortification of flour to prevent neural tube defects, and if it turns out that higher levels of folate are also associated with improved growth rates for the baby, then that would be important as well."